Well, has the quick project bug bitten you yet?! 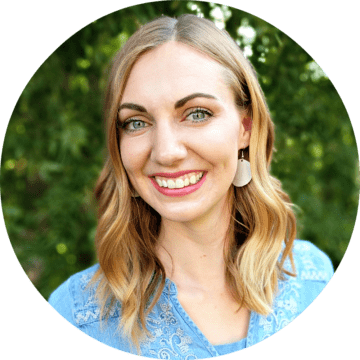 I have been working on these projects all month, so I’m so excited to finally be sharing them with you. These projects were so fun to think up and make! It’s pretty easy to make simple things for girls, but let’s not leave out the boys! 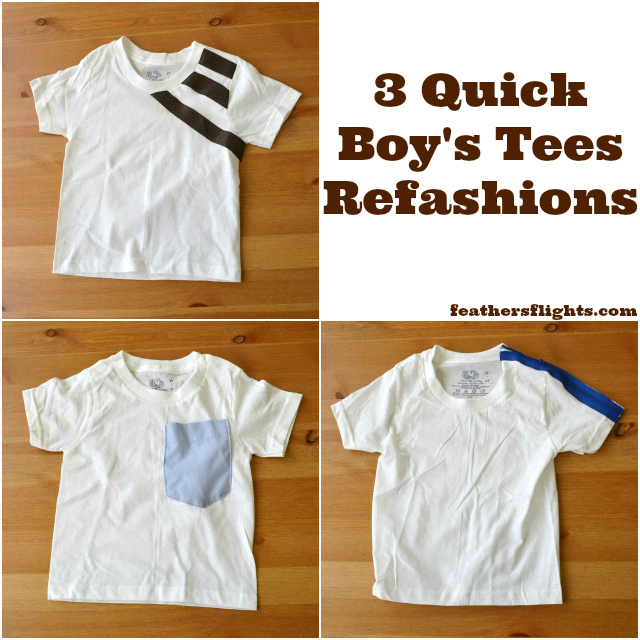 I’ve got three boy’s tees upcycles to inspire you today! First up, the zipper tee. You need a basic tee and a zipper. Pin the zipper from the neckline to the sleeve hem along the shoulder seam. Fold both ends under the shirt. 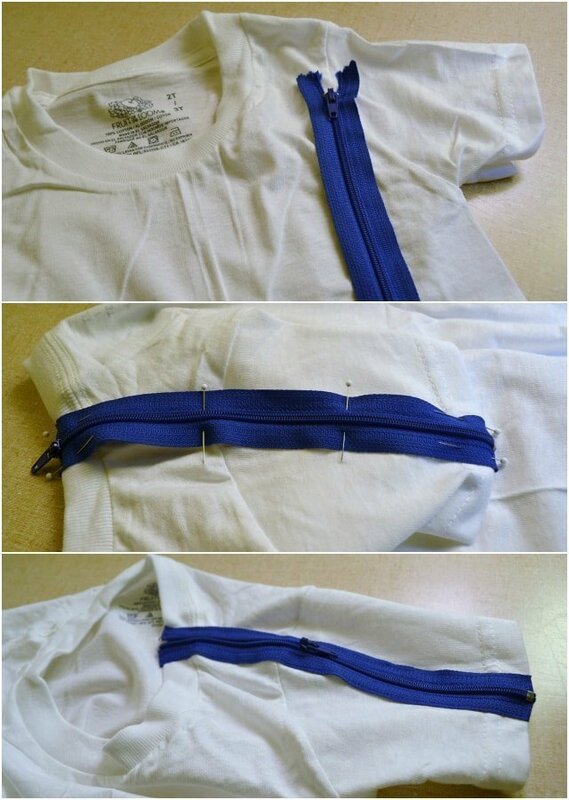 Sew the zipper on with a straight stitch and fold both ends. Done! 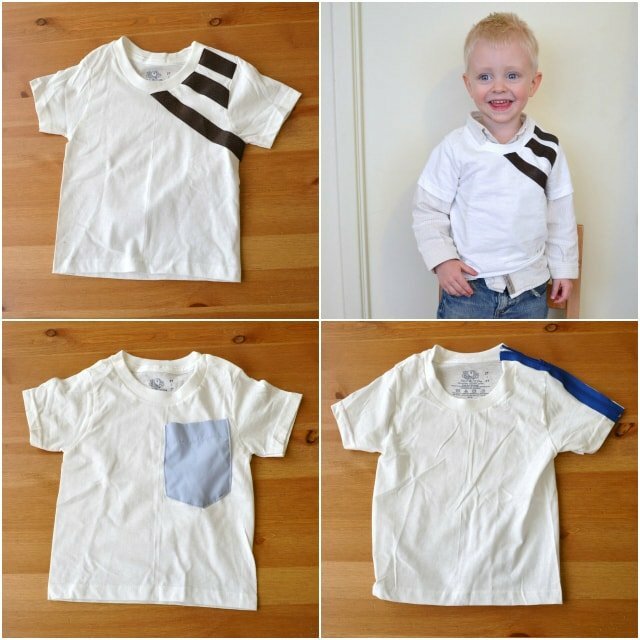 Next, the pocket tee. You need a basic tee and a pocket from a men’s button up shirt. 1. 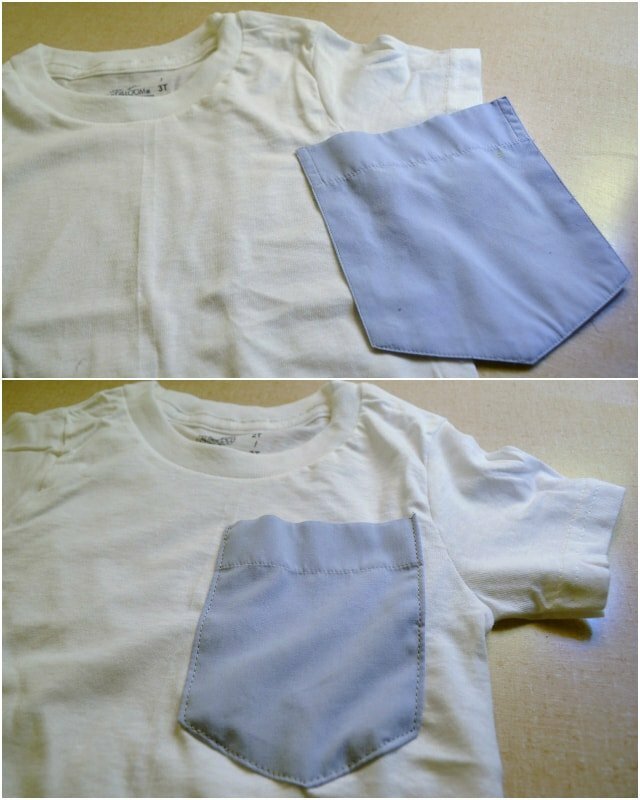 Remove a pocket from a men’s button up shirt. 2. Pin onto the shirt and sew. Done! 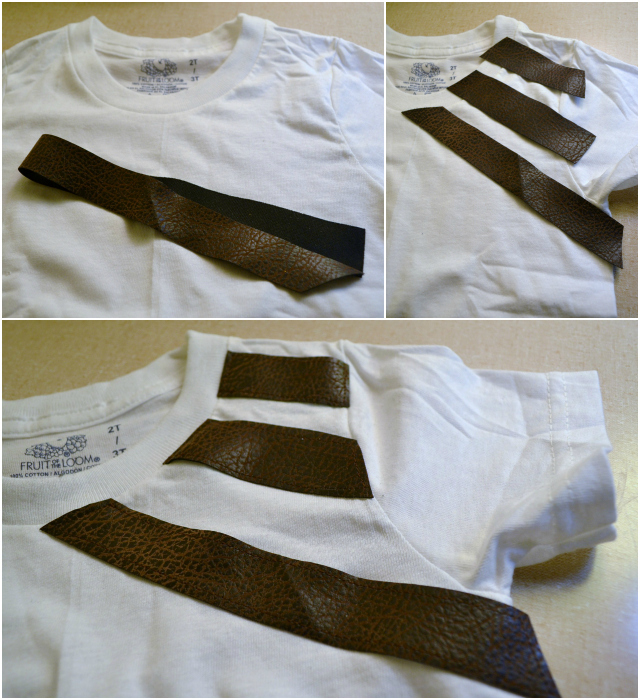 *I did fold the sides and bottoms and extra 1/4″, so that it wasn’t too overwhelming on the shirt. I really like the large off-set pocket on the tee. Lastly, the leather trimmed tee. You need a basic tee and leather or faux-leather strips. 1. Cut the leather into a 3/4″ long strip. Cut it into three pieces that will fit across the side chest and shoulders. 2. I cut mine extra long so I could pin the ends then go back and trim them after. 3. Sew on with a straight stitch. Trim ends. Done! I really love these basic tees and think they look so great on Henry! 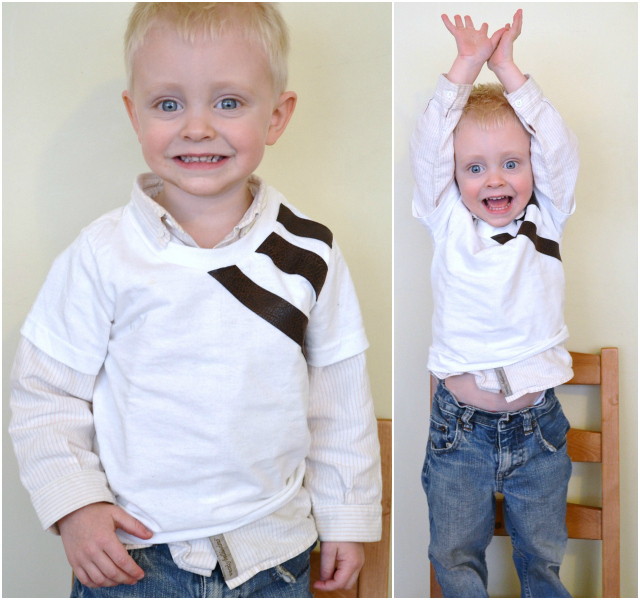 They were so easy, but they’re so trendy and fun for boys! Which one is your favorite of the three? I think I like the zipper one:) cute Henry! Way cool for the boys, and a simple way to dress up what they already have, a bunch of white t-shirts!